*other sizes by special order, but must meet DOT size limitations for transportation when assembled. Construction - 10 gauge steel wall panels and doors and 16 gauge steel ceiling panels. Structural steel base supports recovery floor and standard 1-1/2” grating. Double doors swing open full width and full height for easy part loading. Large personnel door for ease of entry. Apollo 600 respirator is NIOSH-approved and OSHA certified to protect from lead dust concentrations up to 1000 times the permissible exposure limit. CPF filter removes moisture, oil, and particles from breathing air. Remote control handle stops blasting automatically if operator drops the blast hose. Interlock system prevents blasting if any door is open. View windows allow monitoring of operator without interuption. Flat-Trak® - Low-profile, full-area mechanical recovery is simple to operate and maintain. M-Section® - Full-area recovery with few moving parts to maintain. Grating: standard 1-1/2" thick for 2000 lb/sq ft loading. Pleated filter catridges are automatically pulse cleaned for efficiency and long life. Rigid ductwork connectsblast room to dust collector. Flexible ductwork connects media separator to dust collector. Dust collector sized to suit application — 3,400 cfm for air-wash separator or 4,000 cfm for pneumatic recovery and cyclone separator. 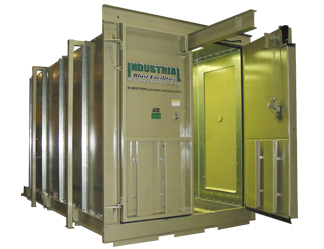 Reclaimer: For lightweight and fine media - 1200 cfm cyclone separator with rubber-lined inlet wear plate and 5-hp booster exhaust motor. Air-wash abrasive cleaner: For heavy and coarse media - Two-stage cleaning with scalping drum and air-wash curtain. Includes bucket elevetor. Optional: rubber-lined reclaimers, magnetic particle separators, dense particle separators, and multi-stage vibratory screen classification for applications that demand it. Control Panel: Externally mounted panel with automatic start sequence and one -button shut down. for Flat-Trak® recovery floors, the panel allows precise control of recovery rates. 6ft³ capacity, 150-psi rated, ASME-code pressure vessel with 1-1/4" piping, pneumatic remote controls and 1-1/2" moisure separator with automatic drain. includes Supa blast hose, 3/8" orifice carbide venturi nozzle and all couplings, gaskets, and locking pins. Pre-Assembled blast room systems include complete plan drawings, air and electrical specifications, installation instrucions and one-day start-up supervision for operational and maintenance training. Most customers, with advice from their Clemco distributor, have resourses and personnel needed to install the complete system. As an option, Clemco can provide turnkey installation.